Dewatering Liners used in specially constructed Roll Off Dumpster Containers fitted with welded in screens of varying styles are essential for large scale sludge dewatering projects and the resulting disposal of remaining solids. Common container sizes are 22 x 8 x 4 or 5 feet on the sides and referred to as 20/25 cu/yd or 20/30 cu/yd. Other sizes cal also be accommodated. Selecting the right liner matched with the best or closest “Micron Rating” is important. We’ve found that by offering our sample test kit is one of the best and fastest methods to zeroing in on the the right liner for the application. 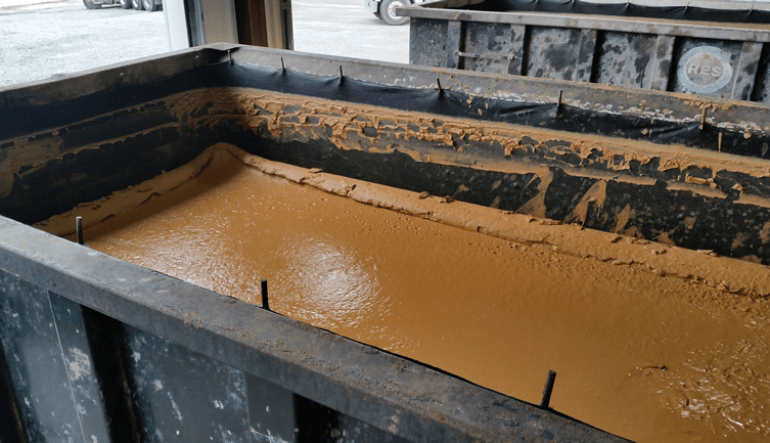 The samples in the test kit are placed over a 5 gallon pail and the sludge or liquids poured in and evaluated at the job site. Stock liners matching the best test sample can be quickly shipped to the job site. We’ll ask you if your container has inside hooks or if the liner will be draped over the top edge of the container. We make every attempt to ship the same day as orders are received and to match the afternoon pickup time of the carrier. We normally ship via Fedex Ground on normal shipments, ensuring on time and speedy delivery throughout the U.S.